IDF soldier opens fire after rocks thrown at Israeli vehicles. One Arab killed, three wounded. An IDF soldier stationed at a military post near Bethlehem on Wednesday evening identified rocks being thrown at Israeli vehicles. In response, he fired his weapon. 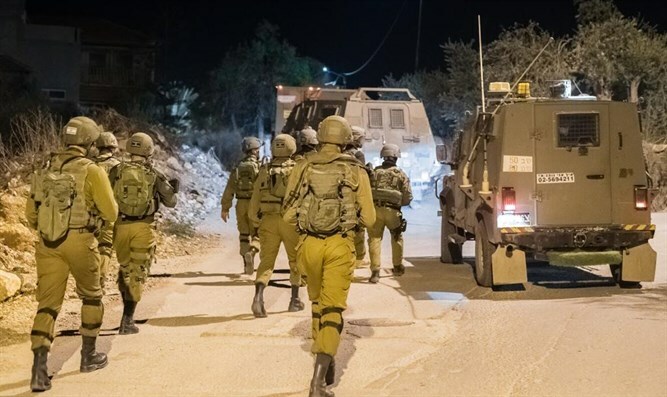 On Tuesday night, terrorists threw explosive devices at IDF forces who were securing the entry of worshipers to Joseph’s Tomb in Shechem (Nablus). The forces responded by opening fire towards the vehicle. In addition, a military engineering vehicle hit the Arab vehicle, killing the two terrorists. That incident came hours after the Israel Security Agency (Shin Bet), the Yaman and the IDF eliminated terrorist Omar Abu-Laila, who carried out the double stabbing and shooting attack at the Ariel junction and at the Giti Avisar junction earlier this week. In the combined attack, IDF soldier Staff Sergeant Gal Keidan and Rabbi Ahiad Ettinger were murdered and another soldier was seriously injured. The Shin Bet said that during the encirclement of the building in which Abu-Laila was hiding in the village of Abwein, near Ramallah, the terrorist opened fire at the Israeli forces and was killed during a gunfire exchange.